Born 1937 in Bratislava. 1951 – 1956 studied composition at the Conservatory in Bratislava. 1956 – 1960 studied composition at the Academy of Music and Drama in Bratislava. 1961 – 1965 worked in the Czechoslovak Radio as music editor. 1965 – 1966 participation in Internationale Kurse für Neue Musik in Darmstadt. 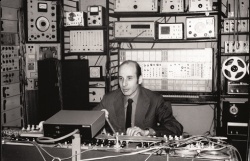 1965 – 1977 founder and head of the Electroacoustic Studio of the Slovak Radio in Bratislava. 1967 – 1968 member of the Board of the Union of Slovak Composers; following the 1968 events, he was evicted from the Union and subsequently persecuted – performance of his works and his publishing activities were banned. 1977 left Czechoslovakia and settled in Austria. 1977 – 2002 he worked as an editor in the Universal Edition in Vienna. He lives in Deutsch-Wagram, near Vienna.